Like any list-maker worth her salt, I have broken down my 2014 into several categories complete with bullet points. 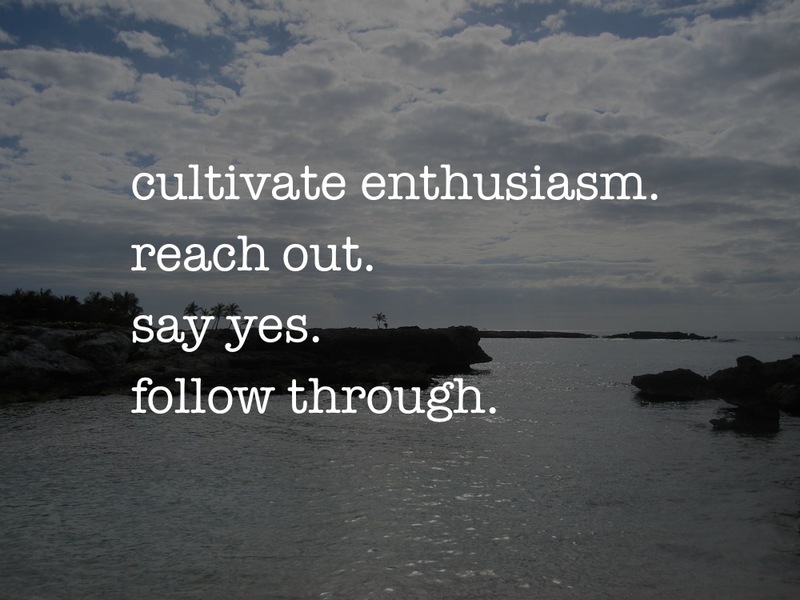 But mostly, anything on those lists boils down to these four things: cultivate enthusiasm; reach out; say yes; follow through. What are some goals you have for the New Year? I like having these simple phrases – the idea is that they’ll help me in the moment. Like when I don’t really want to put on real clothes and go have human interaction. Or when I’m about to say something negative or blasé. I tend to be a worrier, and am looking forward to being a little less pragmatic and a little more adventurous this year. A few more concrete things I want to accomplish in the coming year include finally taking a Photoshop class. (It may be my new unicorn.) There are also a handful of really interesting courses on Skillshare that I’d like to take. I’m enrolled in a fashion draping course, but it started just as the holidays were getting underway, so I haven’t done much in the way of homework. I’d like to improve my photography as well. I also have a growing stack of books to read, both fiction and non-fiction. Ryan was kind enough to get me Creative Confidence for Christmas, and so far it’s excellent! Hopefully the stack of books and online courses will translate into entertaining (and insightful!) blog posts. Another goal is to make sure I post once a week – so I’ll see you soon! Are the words in your Fresh Start picture of your own making? I really love the four short sentences. Thanks! They are. I’ve since dabbled in Photoshop, but for this graphic I used one of my pictures and tinkered with it using Preview for Mac. The program is really basic, but you can still make some nice things! I wanted to distill my 2014 goals into phrases that I’d remember easily. I especially like your 4 brief goals – mind if I use them in my Community Engagement outreach material? Sure thing! Just credit back to the site, please. What community?